In his book Redirect: The Surprising New Science of Psychological Change, Timothy Wilson described the “broken windows” theory of James Wilson and George Kelling. This theory is about neighborhoods and safety. Wilson and Kelling believed that the appearance of neighborhoods made a difference in preventing criminal activity. They proposed that the environment communicated to people information on what behavior was appropriate. Broken windows and graffiti were signals to people that a neighborhood was deteriorating and breaking the law was acceptable. Researchers in the Netherlands tested this idea. One of their experiments was to put a five-euro bill in an envelope with a clear window so the bill could be seen. They placed the envelope halfway out of a mailbox so people walking by could see it. When there were not signs of lawlessness, only 13% took the money. When there was litter on the ground or graffiti on the mailbox, the percentage doubled. People are apparently sensitive to information they get from the environment to the point that it influences decisions they make about what is moral and what is acceptable behavior. For emotionally sensitive people, the message from environmental cues seems to be a particularly strong. My experience is that the environment affects the mood and identity of emotionally sensitive people. Emotionally sensitive people often have thin boundaries. They experience the border between themselves and others as flexible and transparent rather than solid and thick. I would say for some the boundary between themselves and their environment is also thin. So consider what information your home is giving to you. Let’s say there are dirty dishes piled in the sink in the kitchen, glasses sitting around the living room, papers and books on all the floors. Clothes are thrown around on furniture in the bedroom. This is more than disorganization. What message does this send? One possibility is the mess says you don’t matter. You don’t matter enough to have a clean, well-kept environment. Another possibility is that your home tells you that you are out of control or can’t manage your life. Seeing that message everyday is likely to influence the way you feel about yourself. Maybe the mess in your house reflects your sense of powerlessness and helplessness. A messy house decreases the likelihood that you would invite someone over. It is likely to increase isolation. Wait a minute, you might be thinking. My house is a mess because I’ve been sad, depressed, scared, or overwhelmed. My house is a mess because I feel helpless. My house is a mess because I am emotionally sensitive and managing my emotions takes all my energy. That may well be true. The problem is that having a cluttered or unkempt living situation could add to your down mood, lack of self-respect, thoughts of of helplessness, thoughts of being overwhelmed and lethargy. And, like many situations, the problem spirals downward. If your house is messy, you may be giving yourself the message that “messy” behavior is okay. Imagine you are watching a movie on television, eating ice cream from the carton, and enjoying white cheddar popcorn in your living room – which looks like a Texas-sized hurricane passed through. There are papers everywhere, empty soda cans and candy wrappers on the floor, and stacks of unpaid bills scattered over the coffee table. You’re tired when the movie is over and lethargic from the food. What are the chances that you will put your spoon in the dishwasher, throw away the ice cream carton and put up the uneaten popcorn? What are the chances you will pay the bills? If your house was clean and neat and if your bills were in one place where you always do your finances, the chances that you would clean up increase, maybe not that night, but the next day. In the terms of Dialectical Behavior Therapy, cleaning your environment is a form of increasing mastery. Increasing your sense of mastery helps decrease thoughts of helplessness and increases your ability to manage your emotions. Thinking about cleaning a messy house can be overwhelming and discouraging. 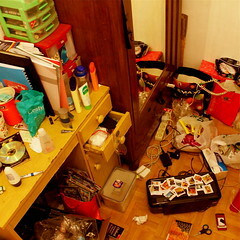 You might want to commit to cleaning for ten minutes each day in one room. Maybe start with your bedroom where you wake up every day. Maybe you could clean for ten minutes in the morning and ten minutes at night. A different strategy would be to do one task each day. For example, on Monday you wash a load of clothes. On Tuesday you wash dishes. Each individual is different. Consider how your living environment affects the way you live your life. If the impact is significant, then make a plan to change your home to a place that is more supportive. Keep the plan doable and simple. Track your progress. Reward yourself for each step that you take. (Really, rewarding yourself is important.) Maybe sort out your belongings, keeping the things that matter to you. Consider making small changes that make your home pleasant and meaningful for you. Note to readers: Please consider taking our survey to help us learn more about emotionally sensitive people. Your responses are anonymous and we’ll discuss the results in upcoming posts. I am very grateful to each person who has helped. We are very close to our target number now and I’m looking forward to sharing the information. Linehan, M. Cognitive Behavior Therapy for Borderline Personality Disorder. New York: New Guilford, 1993. Wilson, Timothy. Redirect: The Surprising New Science of Psychological Change. New York: Little, Brown and Company, 2011.